In this course, you will develop a robust set of skills that will allow you to process, analyze, and extract meaningful information from large amounts of complex data. You will develop talking knowledge, and practical execution knowledge, for the Hadoop platform, it’s architecture and major elements of the ecosystem. Through hands-on instruction and assignments, you will develop working knowledge of tools, for processing massive data sets using the map/reduce framework. You will be exposed to these tools and strategies as they might apply in particular to analyzing big data. 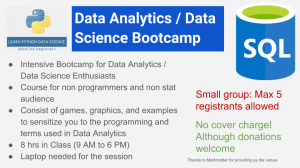 This is designed for non-programmers familiar with SQL and desire big-data skill, and for programmers who are new to big data, or new to big data analytics. Sensitization to Big Data Analytics and trends. Requires no knowledge of programming or database. This course helps you understand how to pull big unstructured using NOSQL and do some computation using python. You have a choice of using R and Python after you have pulled data. Playing with missing data is the most important things and for that I will show five important commands. The more your reduce data before pulling the easier it would be do the computation. Utility functions for data cleaning, charting, looping, error handling will be explained. Charts and pictures in python are sometimes not so intuitive so we would see them on R.
Essential Financial Libraries in Python and R. Exploring applications in Equity and CMBS (for linking all properties linked) Fixed Income Analytics. Course Duration: 2-3 month, 5 classes of 1 hour each with 1 or 2 Live classes each month. Getting ready for the next big data revolution in Finance. Understand the basics of all major languages used for Big Data Analytics. Understanding the importance of handling missing data, visualization limitations and limitations of various methods used. Learn how to work with scikit-learn package to extract and identify useful features that best represent your data, to make classification and clustering models, and to evaluate the performance of your machine learning algorithms. This 20-hour course covers all the basic machine learning methods and Python modules (especially Scikit-Learn) for implementing them. The five sessions cover: simple and multiple Linear regressions; classification methods including logistic regression, discriminant analysis and naive bayes, support vector machines (SVMs) and tree based methods; cross-validation and feature selection; regularization; principal component analysis (PCA) and clustering algorithms. After successfully completing of this course, you will be able to explain the principles of machine learning algorithms and implement these methods to analyze complex datasets and make predictions.